So a couple of weekends ago, I busted out the big graph paper and spent a good portion of my weekend crunching numbers. The result? 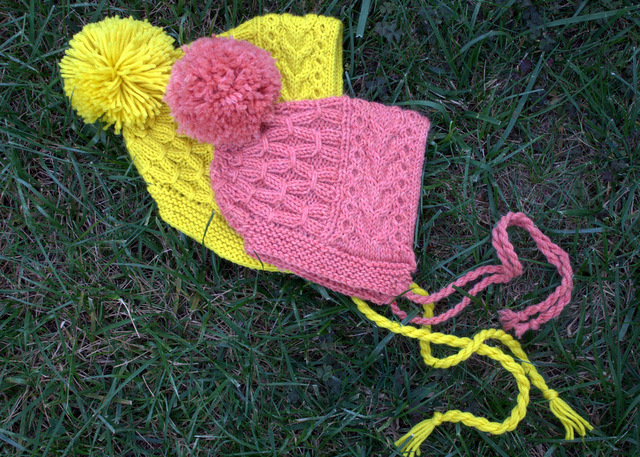 My Neon Ski Bonnet pattern is now available in sizes Child (18″) through Large Adult (24″). You can download it on Ravelry here. Hi there! I absolutely LOVE your neon ski bonnet. But I’m having an issue with the pattern, and I feel like an idiot for not knowing what’s wrong, but I can’t make the band work. I’m trying to make the adult small, but I feel like i can’t make the charts match up after the 54 rnds of Chart A1. Am I supposed to ignore what the chart says for the side twists and just reverse it or am I missing something? Any help you could give would be so great. Thanks so much! Hi Ayla! Glad you like the pattern! After knitting 54 rounds of Chart A1, you should have just finished the row labeled 6. Then you will start with row 1 of Chart A2. The side twists actually don’t change, just the center cable reverses direction. Hope that helps! Thanks for getting back to me so fast! But I’m still confused. Row 5 of A1 and row 1 of A2 are the same. So how can I start row one if I made the same twist the row before? Ah I see. The last row that you knit should be Row 6 of A1, which does not have a twist. Then when you continue to chart A2, everything will be in line. But the row before row 6 has the same twist as row one of A2. How can that possibly work? I’m sorry to be such a pain, but it’s just not working for me. I find myself having difficulty understanding chart A1. Each row is read right to left, and the key suggests each box represents more than 1 stitch. Please correct me if I’m wrong. I really want to make this hat. Hi Christina! Are you new to chart reading? Each square represents one stitch, yes, but note that where two stitches are worked to produce a cable, the box with the symbol takes up two squares, one for each stitch. P1, right twist cable (Slip 1 stitch to a DPN and hold to the back, knit 1 stitch, knit 1 stitch from DPN), left twist cable (Slip 1 stitch to a DPN and hold to the front, knit 1 stitch, knit 1 stitch from DPN), P1, cable 4 front (Slip 2 stitches to a DPN and hold to the front, knit 2 stitches, knit 2 stitches from DPN), cable 4 back (Slip 2 stitches to a DPN and hold to the back, knit 2 stitches, knit 2 stitches from DPN), P1, right twist cable (Slip 1 stitch to a DPN and hold to the back, knit 1 stitch, knit 1 stitch from DPN), left twist cable (Slip 1 stitch to a DPN and hold to the front, knit 1 stitch, knit 1 stitch from DPN), P1. Hello! Just to let you know that your neon hat is a winner!!! How about some mittens and a muffler…and some mitts to keep us warmer? I am making my second hat…in bright red. My daughter loves the one I made her last year. I had so much fun making hers that I knitted the band for another one and started in again…for me. I would love to see you design more of the cable work. Note regarding the knitting in the round…I use 2 cables for the circle…not dpn or magic loop method. It is less cumbersome and more portable for travel knitting. 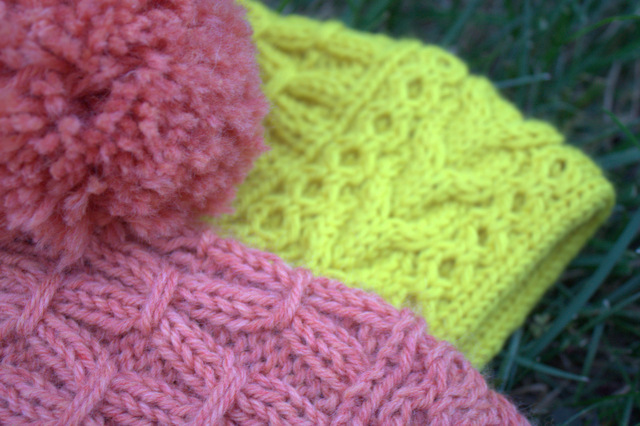 Let me know if you need some pointers on this method…thanks for a great knit! Hi, sweetheart, I really fall in love with your pattern, Im so excited to do it, but i really confused with the work, could you explain it with more details please?